This review originally appeared in Critics at Large and is reproduced on this site because both the novel and the television adaptation prominently feature the element of transgression. 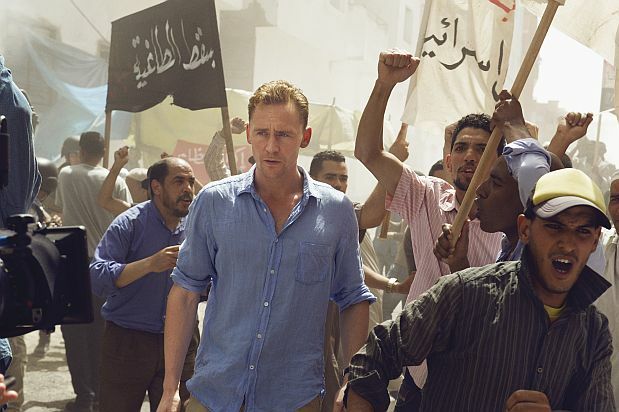 Tom Hiddleston as Jonathan Pine, in AMC's adaptation of' John le Carré's The Night Manager. Part of what made John le Carré’s version of the Cold War so fascinating was the way it avoided a Manichean view of the universe. Shading, ambiguity, and doubt were qualities absent in earlier examples of the thriller from Le Queux, Buchan or Fleming but not in a le Carré Cold War novel. Only the most obtuse reader would fail to recognize how alike Smiley and Karla were, secret sharers on either side of the Iron Curtain. Smiley represented the better side – decent, compassionate and endowed with a healthy skepticism – and he believed that Karla’s fanaticism would be his undoing. However, Karla defected for the love of his lost daughter. Smiley regarded himself as an archetypal liberal – reasonable with measured responses – but he could sustain a murderous hatred for someone who betrayed him, an antipathy that could cloud his judgment. This does not mean that Smiley became Karla: the Soviet spymaster ordered the murder of agents while Smiley did not. Smiley believed in the power of Western democracy but feared that if his side succumbed to Karla’s methods, the decencies he professed will become illusions and feared that he could lose his own humanity. While he agonized over these moral conundrums, Smiley and the intelligence services were civil servants who pursued their opposite numbers. Communist agents were often ruthless murderers but, unless they were moles inside British intelligence, Smiley (or le Carré) did not regard them as evil villains. Then the Cold War ended and le Carré became an angry man. That anger radiates throughout le Carré’s first post-Cold War novel The Night Manager (1993). It is as if the author is questioning whether the principles that inspired the West to fight the Cold War were nothing but hollow rhetoric. If its purpose was designed to protect freedom and capitalism, how is Richard Roper – a wealthy and powerful illegal arms and drugs smuggler operating out of the Bahamas to peddle weapons to anyone who will provide him with a profit and admirer of the odious Idi Amin – possible? Masquerading as a respectable business magnate, he is frequently described as “the worst man in the world” – and le Carré is not intending any sense of irony – because Roper’s greed and callousness without any redeeming features, render him a villain rarely depicted in the Cold War novels. The following is Part II of Through the Mirror Darkly: The Gothic Dimension of the 2016 Presidential Election. Part I was published here yesterday. The piece is an edited adaptation of an address I presented at the Mensa Society International Conference in Toronto on June 11. 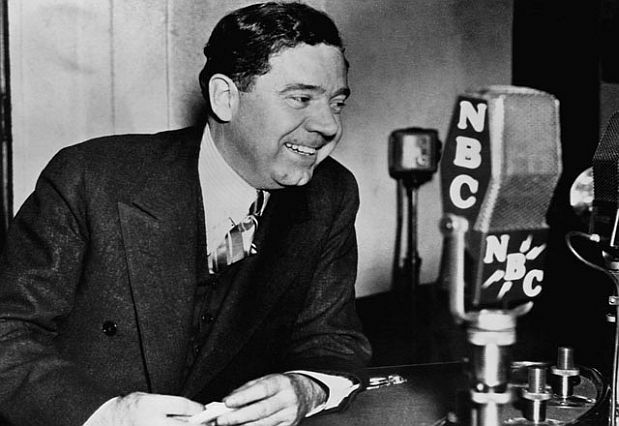 Louisiana politician Huey Long, during a radio broadcast, January 1930. The bigoted nativism that Trump stokes is not unique in the American historical experience. In 1780, papist immigrants were targeted allegedly for their fecundity; in 1850, the scapegoat was the Chinese who allegedly could not assimilate; in 1920, Jews were feared because they threatened the economy. The cartoon does not take into account the no-nothing movement that became the American Party in 1854 which called for the end of Catholic immigrants from Germany and Ireland. But these historical episodes were generally relegated to the political fringes and no major Presidential candidate took them seriously as a major plank in their election campaign. He was intensely interested in himself. He had to dominate every scene he was in and every person around him. He craved attention and would go to any length to get it. He knew that an audacious action, although it was harsh and even barbarous, could shock people into a state where they could be manipulated. My one ambition is to get all Americans to realize that they are, and must continue to be, the greatest Race on the face of this old Earth, and second, to realize that whatever apparent differences there may be among us, in wealth, knowledge, skill, ancestry or strength–though, of course, all this does not apply to people who are racially different from us–we are all brothers, bound together in the great and wonderful bond of National Unity, for which we should all be very glad. Long was assassinated before he had the opportunity to challenge FDR. But the power of Sinclair’s novel has continued to resonate. – Mark Edmundson, Nightmare on Main Street, 1997. 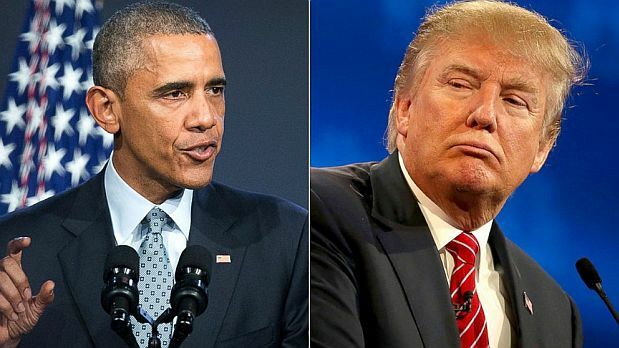 If I were to deliver a political overview about the current Presidential election campaign, I would be substituting Hilary Clinton for Barack Obama. Given that I'm more interested here in delving into Gothic undercurrents, I think it is more apt to explore the values that represent vastly divergent visions of America, and they are best personified by the President and the Republican Party’s standard bearer, Donald Trump. Obama embodies a multicultural, inclusive perspective, a worldview that exemplifies the best of twenty-first century America. At the same time, he champions a cornerstone of traditional American culture, that of civic nationalism – a citizenship that depends upon shared values. Donald Trump represents a parochial, more atavistic view of America, a throwback to an earlier era when racist and misogynous beliefs had legitimacy for large numbers of Americans. His incendiary rhetoric also suggests a belief that citizenship should be based on ethnicity or race, an ideology that almost destroyed Europe in the 1940s, was revived during the genocidal Yugoslavian wars of the 1990, and is once again acquiring populist currency in parts of Europe, a form of ethnic nationalism that flouts the rule of law, celebrates the strong man, and fosters a contempt for and persecution of minorities and immigrants by tapping into a seething geyser of xenophobia and Islamophobia. 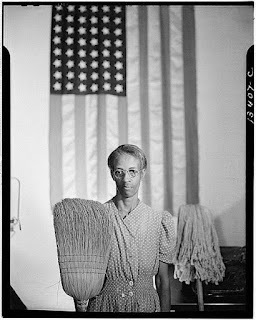 American Gothic, by Gordon Parks (1942). My reference point for the Gothic is not the historical painting, Grant Wood’s 1930 American Gothic, the most iconic in America (even for its countless parodies). 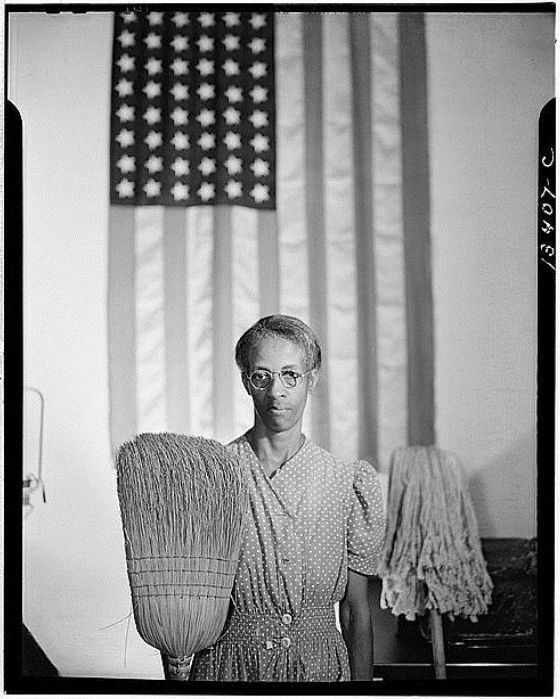 Gordon Parks' 1942 photograph of the same name is more significant given that an African-American woman with her broom and mop is staring out at us with an out of focus American flag behind her. She is more emblematic of someone in a state of quasi servitude. This photograph also suggests that some Americans harbour a more ambiguous relationship with America because their value as citizens is not as esteemed as others. Over a half a century later, Toni Morrison, the Nobel Prize winner for literature, expands upon this idea by exploring how European-American authors have marginalized and ignored African-Americans, or used them as a screen to project Caucasian savagery (even deprived them of their humanity by demonizing them). 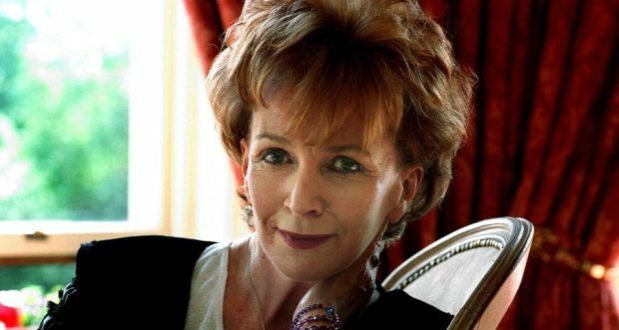 Although her slim 2008 monograph, Playing in the Dark: Whiteness and the Literary Imagination, largely draws upon literary texts from the American canon to develop these ideas, I suggest that her insights can also be applied to the larger culture.